Thangasamy, S. and Jauh, G. (2013). Northwestern Blot of Protein-RNA Interaction from Young Rice Panicles. Bio-protocol 3(7): e625. DOI: 10.21769/BioProtoc.625. The northwestern assay is employed to study the interaction between protein and RNA. The RNA binding proteins tend to bind to different kinds of RNA through either known domains or unknown sequences of proteins. Rice LGD1 recombinant protein, a grass-specific novel protein with RNA binding sequences in its C-terminal, was used to probe its function as an RNA binding protein. The LGD1 comprising von Willebrand factor type-A domain (vWA), coiled-coil and nuclear localization signal (NLS) is a class of protein that localizes both in the nucleus and cytoplasm. Although LGD1 does not contain any putative RNA binding domains, we could find high-affinity RNA binding residues at the C-terminus using ‘RNABindR’ prediction software (Terribilini et al., 2007). The LGD1 recombinant protein, purified from bacteria, somehow forms both dimer and monomer even under denaturing conditions. However, only the dimeric form is able to bind to total and mRNAs. Due to its reproducibility and reliability, we believe that this protocol can be used across different organisms. Total RNA was isolated from young panicles of wild type plants with Trizol kit. ~0.5 g tissue was used to isolate ~500 μg of total RNA and 200 μg total RNA was used to purify ~2 μg mRNA using Oligotex mRNA Mini Kit. Nanodrop was used for final RNA quantitation (~2 μg/μl for total RNA; ~20 ng/μl for mRNA). 5 μg total RNA and 1 μg mRNA were first treated with FastAP Thermosensitive Alkaline Phosphatase (10 U) at 37 °C for 1 h to remove 5’-phosphate group according to manufacturer’s protocol. The total and mRNAs were end-labeled with [γ-32P]-ATP using 1 μl (10 U) T4 Polynucleotide kinase at 37 °C for 30 min. Labeled RNAs were separated from unincorporated label by gel filtration on Sephadex G-50 column. GST-LGD1 fusion protein was extracted from E. coli harboring pGEX-4T-1 GST expression vector according to manufacturer’s protocol. The proteins were separated on 12% SDS PAGE under denaturing conditions, and transferred to PVDF Immobilon-P membrane and detected using the SNAP i.d. protein detection system as follows. For the Western blot, the primary anti-GST antibody (1:2,000) and secondary HRP (horseradish peroxidase)-conjugated antibody (1:3,000) were used for the enhanced chemiluminescence (ECL) detection. SuperSignal West Pico Chemiluminescence was employed to detect western signals according to the manufacturer’s instructions. For the Northwestern, recombinant proteins separated on 12% SDS PAGE under denaturing conditions were transferred to PVDF Immobilon-P membrane. The proteins were then renatured on the blots overnight at 4 °C in a renaturation buffer containing 0.1 M Tris HCl (pH 7.5) and 0.1% (v/v) NP-40. Blots were washed 4 times 15 min each in renaturation buffer and incubated 5 min at room temperature in blocking buffer. Blots were hybridized overnight at 4 °C in blocking buffer (without BSA) in the presence of labeled total and mRNAs. Finally, the blots were washed 4 times 5 min each in blocking buffer (without BSA and Triton) and autoradiographed to obtain the signal as seen in Figure 1. Figure 1. Northwestern blot analysis of LGD1 recombinant protein. The recombinant GST-LGD1 was purified from E. coli and analyzed through SDS-PAGE, western and northwestern blots. (a) Coomassie Brilliant Blue (CBB) staining shows two major bands (arrows). The size of the lower band is ~56 kD (monomer) and upper band is ~112 kD (homodimer). 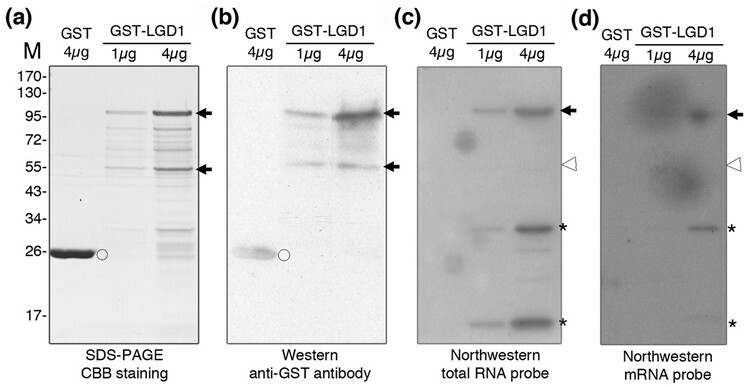 (b) Anti-GST antibody recognizes the GST-LGD1 fusion protein (arrows) as well as GST (open circle). Northwestern blot shows the total RNA. (c) and mRNA (d) isolated from young panicle tissues bind to upper band (arrows), but not to the lower band (open arrowhead). Asterisks indicate RNA binding to degraded form of LGD1. We greatly appreciate the contributions of Drs Yue-Ie Hsing, Chyr-Guan Chern, Ming-Jen Fan and Su-May Yu to generate the TRIM database. We also thank Drs Ko Shimamoto (Nara Institute of Science and Technology, Japan), for sharing the pANDA-RNAi vector, and Su-May Yu (Institute of Molecular Biology, Academia Sinica), for excellent support with rice transgenic experiments. We also thank Ms Lin-Yun Kuang (Transgenic Plant Laboratory, Academia Sinica) for assistance in particle bombardment. We are grateful to Ms. Krisa Fredrickson for her English editing. This work was supported by research grants from Academia Sinica (Taiwan), the National Science and Technology Program for Agricultural Biotechnology (NSTP/AB, 098S0030055-AA, Taiwan), the National Science Council (98-2313-B-001-001-MY3, Taiwan) and the Li Foundation (USA) to Guang-Yuh, Jauh. Uyttewaal, M., Mireau, H., Rurek, M., Hammani, K., Arnal, N., Quadrado, M. and Giege, P. (2008). PPR336 is associated with polysomes in plant mitochondria. J Mol Biol 375(3): 626-636. Terribilini, M., Sander, J. D., Lee, J. H., Zaback, P., Jernigan, R. L., Honavar, V. and Dobbs, D. (2007). RNABindR: a server for analyzing and predicting RNA-binding sites in proteins. Nucleic Acids Res 35(Web Server issue): W578-584. Thangasamy, S., Chen, P. W., Lai, M. H., Chen, J. and Jauh, G. Y. (2012). Rice LGD1 containing RNA binding activity affects growth and development through alternative promoters. Plant J 71(2): 288-302. How to cite: Thangasamy, S. and Jauh, G. (2013). Northwestern Blot of Protein-RNA Interaction from Young Rice Panicles. Bio-protocol 3(7): e625. DOI: 10.21769/BioProtoc.625.